A bit of a slow news day to start Monday so kick it up a notch here's a lovely game you might want to play, and that's Darkmere ( Prequel to Dragonstone ), which was released way back in 1993/4 developed by Zero Hour Software and published by Core Design. This game classed as an action adventure RPG that has very decent Amiga graphics and a dark overtone, has since been packaged together with an emulator by Gamesnostalgia and can be launched on a PC or Mac without having to be set up! 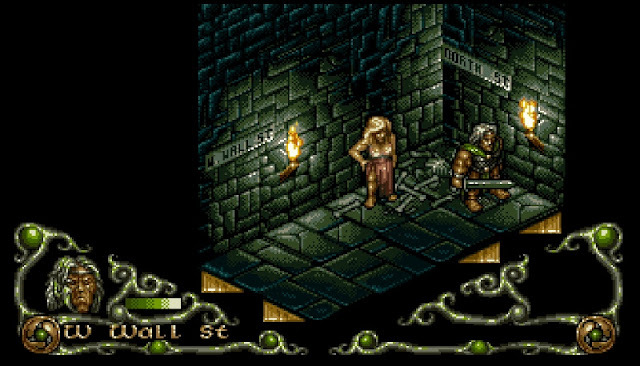 Although it doesn't look much nowadays, Darkmere for its time was a very decent looking Amiga game that was praised for its artwork, animation and graphics. Not just that but if you did happen to play it, you'd be taken back by the sound effects with blowing wind, creaking fireplaces and even chirping birds in some of the later wooded levels. In fact the game did have different themed areas, with old medieval villages, forests and even dark caverns that sometimes contained a nasty orc or two! Something you'd have to face with sword in hand to complete the odd quest.... So if you haven't played it now's the time to do so as what i've mentioned is just a small part of Darkmere!